From the left, Kiam Kaiser of Berlin, Seiji Akera of Berlin, Axton Pulliam of Berne-Knox-Westerlo and Nick Miller of Greenville present their electronic limb mapping project to Capital Region BOCES Assistant Superintendent Lynne Wells. 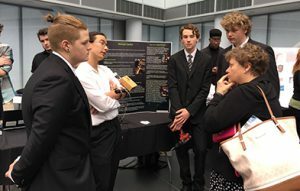 On Wednesday, May 10, Tech Valley High held its annual Expo, a student project showcase in the atrium of SUNY Polytechnic Institute’s ZEN building. The expo was a great presentation of how hard TVHS students and teachers work to create dynamic, authentic projects in both the STEM and Humanities fields. The projects were created during classes from all disciplines throughout the school year. Students were asked to revise them, create a pitch and a visual display. Maeve Corcoran of Brunswick, Mackenzie Squair of Cobleskill-Richmondville and Anthony Delmonico of Menands for their game board. A tie between Kareel Slager of Coxsackie-Athens & Dylan Rapp of Ichabod Crane, and Jayde Becker of Hoosick Falls & Aaron Smith of Greenville for their respective game boards. Seiji Akera of Berlin, Kiam Kaiser of Berlin, Axton Pulliam of Berne-Knox-Westerlo & Nick Miller of Greenville for their mechanical arm/electronic limb mapping project. Bennett Plowman of Brittonkill & Hannah Hoyt of Menands for the school play. Award winners were given gift cards to Barnes & Noble and Best Buy. The awards were sponsored by the Tech Valley High School Foundation. Congratulations to all students for participating in the showcase, which was acclaimed as a “next level event” by Questar III District Superintendent Gladys Cruz.